Christmas is just around the corner and I thought it would be helpful again to list some present ideas! Some of these are things I would like to receive myself! Here is a link to a similar post I wrote last year with more ideas. 1. 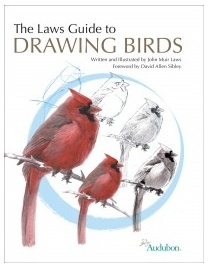 The Laws Guide to Drawing Birds is one of the books I would love to add to my bird book collection. As I’m trying to learn more about drawing birds, this book look very good and helpful. 2. I really like birding calendars, and my favorites are the ones by David Sibley. Here is The Birder’s Year 2013 calendar by David Sibley. David Sibley also has posters of North American Hummingbirds, Backyard Eastern US Birds, Backyard Western US Birds, which are very nice too! More items by David Sibley can be seen here at his website. 3. Earlier this year I won an autographed copy of the Crossley ID Guide to Eastern Birds by Richard Crossley. It’s a wonderful book with terrific photos. I find it very helpful when I’m trying to figure out the age of raptors. 4. You can give a gift memberships to the American Birding Association, Bird Studies Canada, the Cornell Lab of Ornithology, or any other birding/nature groups. With all of these groups you will receive various publications and exclusive member info, and you know that you are supporting a good cause. 5. The new coffee-table book from National Geographic and the Cornell Lab of Ornithology, Birds of Paradise: Revealing the World’s Most Extraordinary Birds. The cover looks beautiful, and I would really like to read it! My mother was looking for some documentary DVDs from our library through interlibrary loan, and requested the BBC’s “Attenborough in Paradise and Other Personal Voyages“, which we watched last week. “Attenborough in Paradise” is a wonderful documentary written and presented in 1996 by Sir David Attenborough, the English naturalist and broadcaster. When he was nine years old, he read “The Malay Archipelago” (1869) by the English naturalist and biologist Alfred Russel Wallace; the book is free online at this link. If I can find the book through the library, I will be sure to get it and write and post a review here. Ever since, Sir David had wanted to see the birds in their paradise. (In fact, just last year, in November 2011, he gave the Darwin Lecture, speaking on “Alfred Russel Wallace and the Birds of Paradise”, organized and hosted by the Royal Society of Medicine in association with the Linnean Society of London). Probably some of the most beautiful and elegantly plumed birds in the world are Birds of Paradise. Birds of Paradise are only found on the island of New Guinea and surrounding islands. They perform some of the most interesting courtships and display extravagant plumes that some consider the most beautiful in the bird world, but little is know about the evolution of these birds. I realized after watching the documentary from 16 years ago that it fits in very well with several current ornithological projects. One of these projects is National Geographic’s “Winged Seduction: Birds of Paradise”/”Birds of Paradise: An Avian Evolution”, which includes an exhibit, a book, and a documentary film. The projects are all based on eight years of research and 18 expeditions, begun in 2004, by Edwin Scholes, a Cornell Lab of Ornithology scientist, and Tim Laman, a field biologist and photographer for National Geographic. They decided to do the first comprehensive study of all Birds of Paradise, covering all 39 known species, and were able to document several new behaviors. 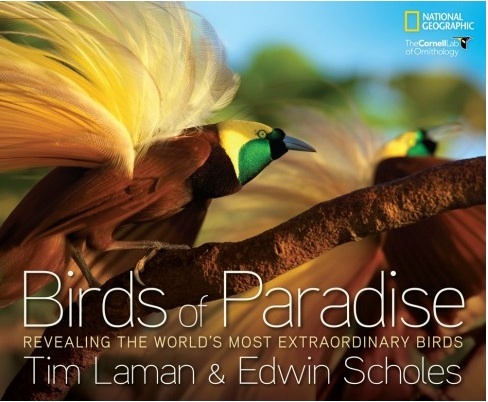 Along with the exhibit, National Geographic and the Cornell Lab of Ornithology have published a coffee-table book Birds of Paradise: Revealing the World’s Most Extraordinary Birds. The cover is beautiful, and it sounds very much like a book I’d like to read. It would also make a great holiday present for your favorite birder! The book is available from the Cornell gift shop and at Amazon. The documentary film of the project, “Winged Seduction“, just had its world premiere at Banff, Alberta (in my own province!) at the end of October, and Tim Laman and Edwin Scholes were there to present and introduce the film and speak about their work to photograph, film, and study these extraordinary birds. The movie first aired on television on Thanksgiving on the National Geographic channel. We don’t have cable TV, so I am looking forward to the DVD, which will be available in a few days, on November 27th. For anyone else who is interested in the documentary, there is a terrific trailer of the Birds of Paradise project. Also, there is an exhibit currently at the Royal Alberta Museum in Edmonton that ties in well with the Cornell/National Geographic project: “Fashioning Feathers: Dead Birds, Millinery Crafts and the Plumage Trade”, about the dangerous connection between fashion and natural history, which opened in March and runs through January 6, 2013. 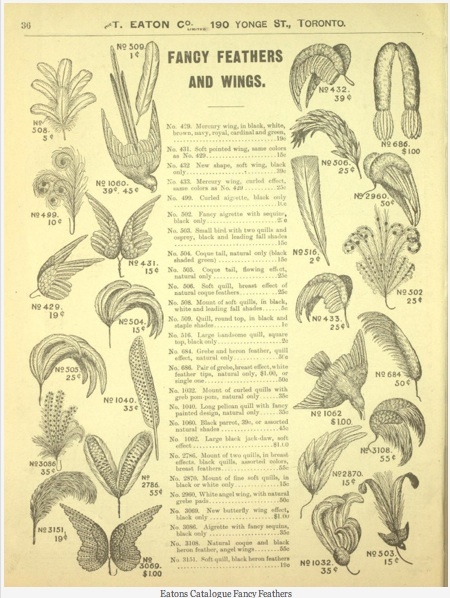 A wonderful source of information on Birds of Paradise is the Fashioning Feathers blog, maintained by Dr. Merle Patchett, who created and curated the exhibit. The blog documents the making of the exhibit at the Royal Alberta Museum. You can find more information here. The blog has a whole page devoted to the Birds of Paradise, and I recommend reading it from top to bottom! Unfortunately, because of such lovely feathers, the Birds of Paradise, especially the Lesser and the Greater Birds of Paradise, were greatly sought after for several hundred years, until the early 20th century. The first known “trade skins” of Birds of Paradise were seen by Europeans in 1522, but European naturalists would not see a live specimen until 1825. When prepared specimens were first brought back to Europe, they caused great excitement, not only because of the beautiful plumes, but because the birds didn’t seem to have any legs or wings. The birds had been prepared by the indigenous traders their traditional way, removing both the legs and wings to better show off the feathers’ beauty; the traders would cut off the wings and feet, then skin the body up to the beak, removing the skull. A stick was then run up through the specimen coming out at the mouth. (This is very much how we learned to prepare study skins at Long Point this past summer). The Europeans assumed from this presentation that the birds lived their whole lives in the air, feeding on dew, and only coming to the ground when they died. Wallace returned to England in 1862, with more than 125,660 specimens, mostly insects and birds. He also brought back several live Birds of Paradise, with their legs and wings intact. When the earliest European voyagers reached the Moluccas in search of cloves and nutmegs, which were then rare and precious spices, they were presented with the dried shins of birds so strange and beautiful as to excite the admiration even of those wealth-seeking rovers. The Malay traders gave them the name of “Manuk dewata,” or God’s birds; and the Portuguese, finding that they had no feet or wings, and not being able to learn anything authentic about then, called them “Passaros de Col,” or Birds of the Sun; while the learned Dutchmen, who wrote in Latin, called them “Avis paradiseus,” or Paradise Bird. John van Linschoten gives these names in 1598, and tells us that no one has seen these birds alive, for they live in the air, always turning towards the sun, and never lighting on the earth till they die; for they have neither feet nor wings, as, he adds, may be seen by the birds carried to India, and sometimes to Holland, but being very costly they were then rarely seen in Europe. …the males assemble early in the morning to exhibit themselves in the singular manner already described… This habit enables the natives to obtain specimens with comparative ease. As soon as they find that the birds have fled upon a tree on which to assemble, they build a little shelter of palm leaves in a convenient place among the branches, and the hunter ensconces himself in it before daylight, armed with his bow and a number of arrows terminating in a round knob. A boy waits at the foot of the tree, and when the birds come at sunrise, and a sufficient number have assembled, and have begun to dance, the hunter shoots with his blunt arrow so strongly as to stun the bird, which drops down, and is secured and killed by the boy without its plumage being injured by a drop of blood. The rest take no notice, and fall one after another till some of them take the alarm. The indigenous mode of preserving them is to cut off the wings and feet, and then skin the body up to the beak, taking out the skull. 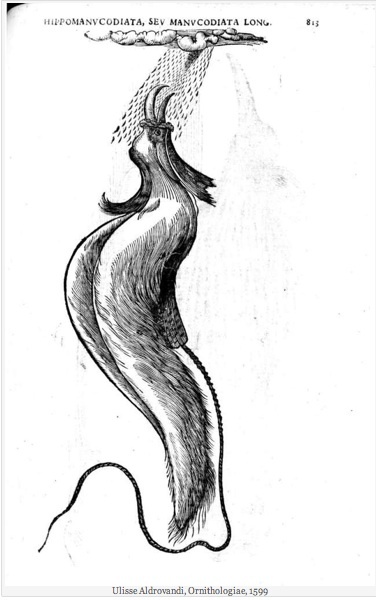 A stout stick is then run up through the specimen coming out at the mouth. During the “plume boom”, in the early 20th century, the Greater Bird of Paradise was very close to extinction, with up to 80,000 skins were exported from New Guinea each year. The killing of Birds of Paradise for the millinery trade was first addressed in the 1920s when it became illegal to export from New Guinea the feathers from all species of Birds of Paradise, though to this day illegal hunting and exporting continues; Birds of Paradise are also in danger from deforestation. Interestingly, ne of the changes that helped save the Birds of Paradise also happened around the 1920s, with the change in women’s hairstyles from long hair to the shorter bob. The close-cropped style couldn’t support large hats and so the demand for feathers dropped considerably. I would love to travel to New Guinea one day, and see any of the species of the Birds of Paradise in their natural habitat. It seems sad that on the one hand such exquisite creatures should live out their lives and exhibit their charms only in these wild inhospitable regions, doomed for ages yet to come to hopeless barbarism; while on the other hand, should civilized man ever reach these distant lands, and bring moral, intellectual, and physical light into the recesses of these virgin forests, we may be sure that he will so disturbed the nicely-balanced relations of organic and inorganic nature as to cause the disappearance, and finally the extinction, of these very beings whose wonderful structure and beauty he alone is fitted to appreciate and enjoy. This consideration must surely tell us that all living things were not made for man. Many of them have no relation to him. The cycle of their existence has gone on independently of his, and is disturbed or broken by every advance in man’s intellectual development; and their happiness and enjoyment, their loves and hates, their struggles for existence, their vigorous life and early death, would seem to be immediately related to their own well-being and perpetuation alone, limited only by the equal well-being and perpetuation of the numberless other organisms with which each is more or less intimately connected. There is also an episode of the PBS Nature series on Birds of Paradise, “Birds of the Gods”, also with David Attenborough, now available on DVD. Our library doesn’t have it so I’ll have to figure out another way to find it, maybe at YouTube. 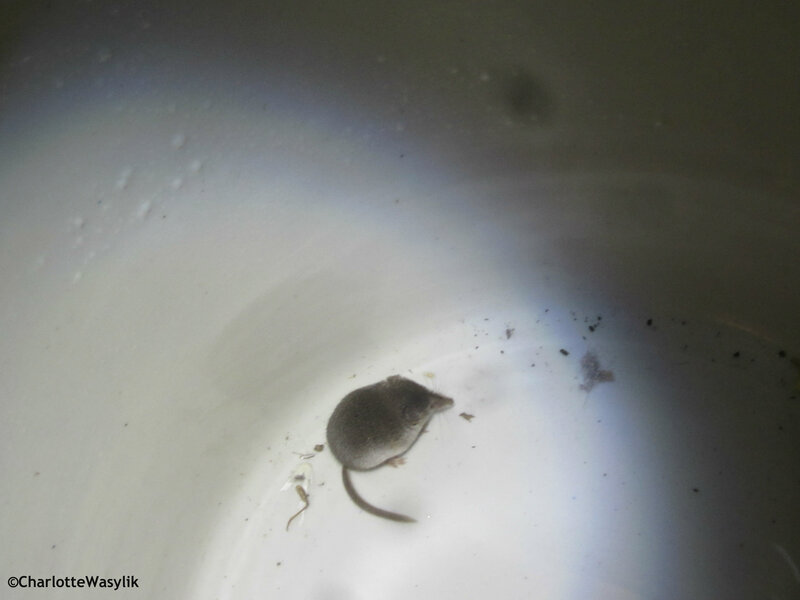 This Masked Shrew was stuck in our cold room yesterday. Shrews are insectivores, will kill and eat young mice, and are normally nocturnal. 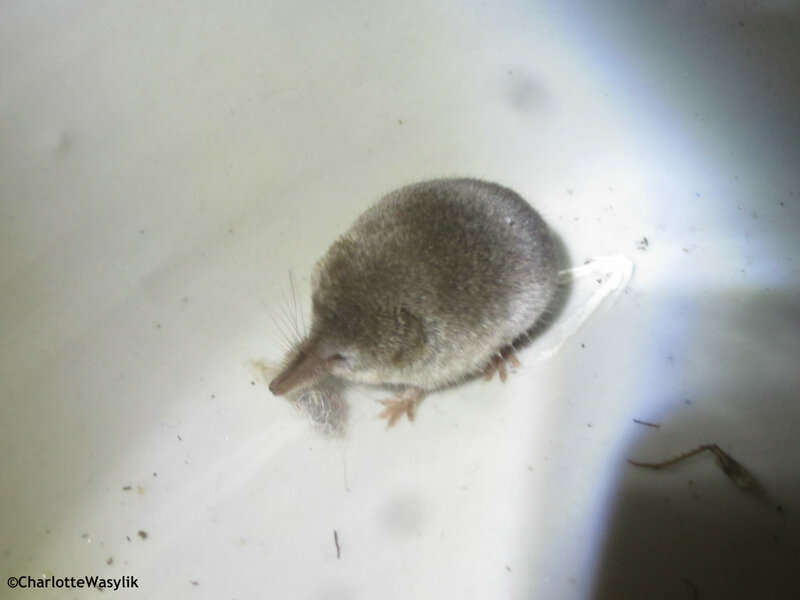 The Masked Shrew is the most common shrew in North America. So far, I’ve seen 23 mammal species this year, but I wasn’t expecting any shrew species. 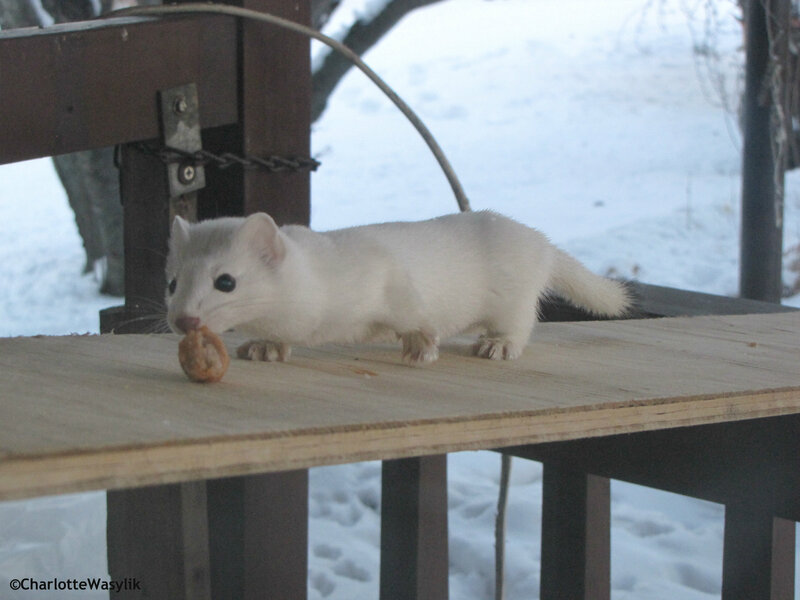 I wanted to share some photos of a Long-tailed Weasel that I took last week, on the 14th, at my grandparents’ house. A weasel has been visiting my grandparents’ yard for about four years now, and it’s very tame, so we think it’s the same one. In the background you can see snow, which arrived in October. It’s been very wintery here since then. As a pretty typical 15-year-old, I like technology! I love my laptop and iPod. And best of all, they can be used very well with some other things I love, birds and birding. I didn’t get hooked on birding because of the technology, but as I’ve become more involved with social media, I am finding various technologies to be a very useful tool. For example, I am working on a project with a friend for a birding event in April, preparing a “Young Naturalists’ Corner”. It would be much harder — and slower — getting everything done without email, digital photography, etc. Especially because I live on a farm in a very rural part of Canada, it’s very nice to have online and digital technology to keep in touch with others and to get, and send, information. No-one in my family has a cell phone (my parents are quite frugal and also don’t like the interruptive nature of cell phones), so I’m not able to use birding apps. However, I have been downloading the good free ones to iTunes whenever they become available, so I’ll be ready when I do get a smartphone! You definitely don’t need a smartphone to enjoy birding technology. Many organizations like the ABA, Pledge To Fledge, National Audubon Society, and the Cornell Lab of Ornithology are trying to get more young people interested in birding and nature. One thing which seems to spark that interest is the use of technology and social media. Twitter, Facebook, and other social media sites can be used very easily by birders. There are quite a few Facebook bird groups to join. Some of my favorites are for the American Birding Association, ABA Area Rare Birds, Birders who Blog, Tweet, and Chirp, the Alberta Birds group I started in May — the list just keeps going. On Twitter you can follow a variety of birding organizations, retweet links, and keep tabs on your favorite blogs. I’ve also found Facebook very helpful for keeping in touch with other birders I’ve met across the country and in the U.S., including the friends I made at the Long Point Young Ornithologists’ Workshop. 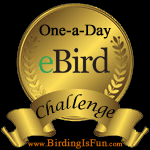 eBird is one of my favorite birding websites and a very useful birding tool. I try to submit a checklist everyday, but don’t always have time. It’s a great way to keep track of multiple lists (for example, patch list, year list, life list, county list). eBird is also a great place for learning about rare birds in your area or North America, looking at species distribution, and migrations routes. It’s an easy and fun way to enrich one’s knowledge of conservation and science about birds. You can also try to be a top lister in your province/state or county; in the province of Alberta, I’m 38th out of 100 for species seen this year. I highly recommend joining eBird! Most states and provinces should have at least one birding listserv, for example, at Yahoo groups. The ABA has a list of all the provincial, state, and worldwide listservs. Also, Birding News from ABA is a very simple way to navigate through the listserv posts on just one site, and with BN you don’t need to join any listserv if you don’t want to. There are quite a few good birding apps available. One thing to remember, though, is that they aren’t priced like the usual 99¢ apps. The Sibley eGuide to the Birds of North America costs $19.99 which might seem high, however, you’re getting audio for almost every species, all of the information from the book is in the app, the search functions make it very easy to search for birds, and the app is much more convenient than lugging around a printed field guide on a birding trip. Birding Is Fun has a survey of birding apps, which shows what apps are available for phones and tablets. Birding podcasts are another type of technology. I really enjoy them and learn a lot about birding news. It’s also a fun way to listen to some of your favorite birders. My favorite is the Birdchick Podcast, very entertaining, great birding stories; I highly recommend subscribing the this podcast! Laura Erickson’s For the Birds, WREN Radio, and This Birding Life are great podcasts too! Two of the birding radio shows I listen to most often are Ray Brown’s Talkin’ Birds out of Massachusetts and Bird Calls Radio of Connecticut. I listen to them live on my laptop, or as podcasts. And of course there are the bird blogs! A full list of all the blogs I follow is on my sidebar at right under Bird Blogs and Canadian Bird Blogs. Another Alberta birder, David Pugh, just wrote a blog post and gave a presentation on technology for birders. You can find it here at his blog Calgary Birder. Edited to add: I almost forgot to mention another way I like to use my iPod — one item I usually take along with me is a Grace Eco Extreme, a rugged waterproof iPod case with speakers. My mother found it for me at Amazon.ca (for the same price as at Amazon.com, which is unusual), and bought it in orange, so it’s easy to spot if I set it down. I use it with my Ipod Classic which has almost 1,500 bird songs on it, from a variety of sources (Stokes, Cornell Lab of Ornithology, etc.). The Grace Eco Extreme has very good volume for playing bird songs and excellent sound quality. 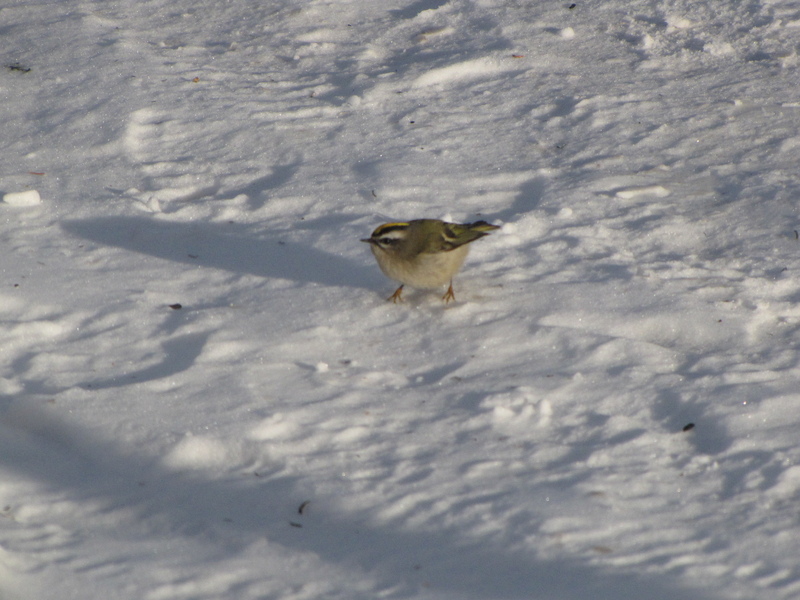 Winter is a hard time for birds, especially in north central Alberta. Grasses are covered in snow so the seeds are hard to get; the berry supply starts to dwindle and also gets snow-covered; and insects are either hidden underground, indoors in houses, or burrowed deeply into tree trunks. 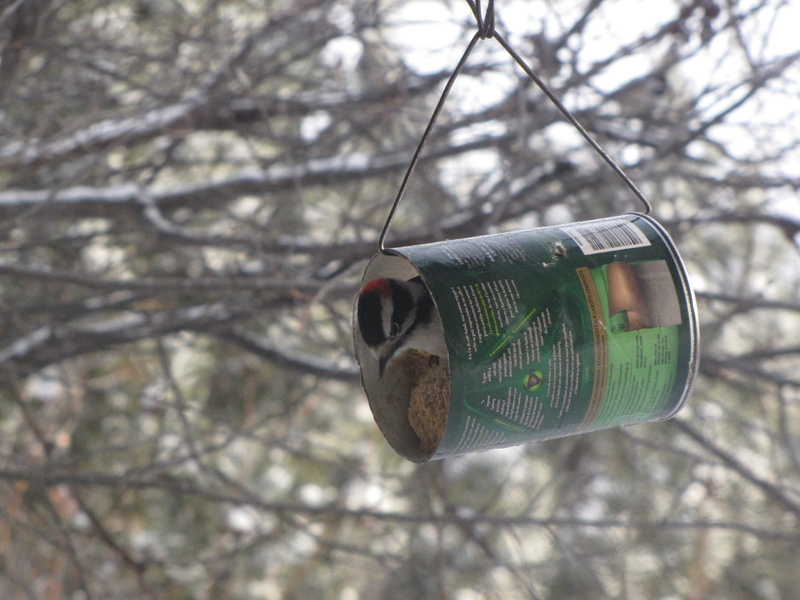 Before people started feeding birds through the winter, birds survived without man-made bird feeders, but putting up feeders does give birds more of a chance in winter and it’s fun to see which species will visit your feeders. If you feed birds, you must clean your feeders regularly and thoroughly to prevent the spread of disease. Clean and disinfect feeders often, one or two times a month should be sufficient. Use nine parts warm water to one part household bleach to thoroughly disinfect your feeders. Here are some of my suggestions if you are new to feeding birds, or you would like to try something different and fun! I’ve given some links, for informational purposes only. I particularly like Droll Yankees feeders, which I know well because I’ve won eight of them from Ray Brown’s Talkin’ Birds radio show (the Mystery Bird segment). Their feeders are good quality, withstand Alberta’s extreme elements very well, and are made in the United States. But I’m not sponsored by or an affiliate of either Droll Yankees or Amazon or any other store. If you want to offer only one type of seeds to birds, black-oil sunflower seeds are the way to go! Black-oil sunflower seeds are fairly inexpensive, especially when bought in bulk. Black-oil sunflower seeds are easier for birds to open than the striped sunflower seeds, and the kernel is larger too. 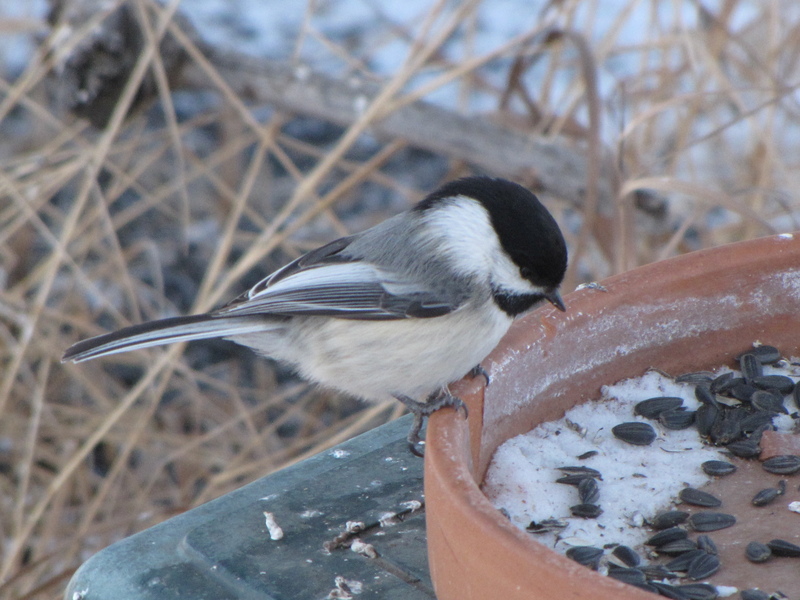 Sunflower seeds can be put in a hopper-, tray-, or tube-feeders, or on the ground. You can also buy the sunflowers seeds hulled, it’s a little more expensive, but it reduces the waste on the ground and it’s also a big treat for the birds. Nyjer (thistle) seed is a favorite among finches, although it can be expensive. It is a small black seed, and is best put in a nyjer feeder or a nyjer sock. You don’t have to worry about Nyjer seed sprouting because it is heat-treated, but it can go rancid or moldy quickly in wet weather, so it’s more economical to buy in small bags and keep it dry. Some seed mixes are better than others. Talk to other birders in your area to see what they have to recommend. Cheap mixes are usually not the best quality, with lots of filler that birds don’t like, such as red millet and milo. The better mixes have sunflower seeds, peanuts, white millet, and cracked corn. There are also some specialty online stores where you can custom-make your mixed-seed blend. 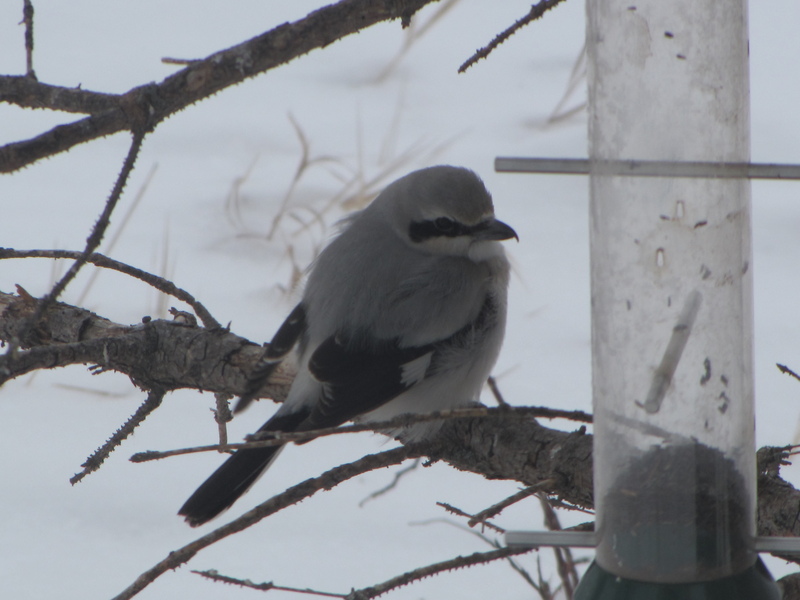 Birds need a lot of energy and protein to get through an Alberta winter, and peanuts are a great source. Jays, nuthatches, woodpeckers, and chickadees will readily visit a feeder for peanuts. If you provide peanuts, make sure they are unsalted and not honey-roasted either! Suet is a great source of energy for birds. You can provide plain suet, or you can mix it with nuts, raisins, and other fruit. You can buy the mixtures, or make your own. Suet can be provided in a variety of feeders: smeared on a branch or log, in a suet cage, in a tray, or in a mesh onion bag. Here’s a good page from the Cornell Lab of Ornithology about the different kinds of feeders with some photographs. In the winter birds eat snow to keep their bodies hydrated. It does bring down the bird’s body temperature, but they can survive. They also will bathe in the snow to keep their feathers clean. Heated bird baths are wonderful for cold climates. The heater doesn’t actually heat the water, it just keeps the water from freezing. I don’t have a heater so I just take warm water and thaw the ice in the bird bath every morning. Never put any anti-freezing chemicals in the water or use any harsh chemicals, such as bleach, to clean the bird bath either. Sun is a natural disinfectant and it is good for bird bath. 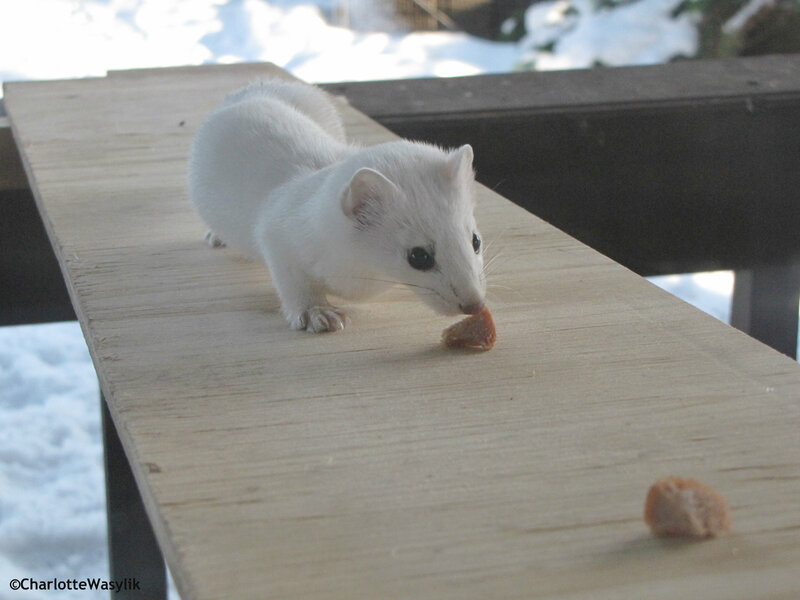 When feeding birds, be prepared for some surprises at your feeding station. 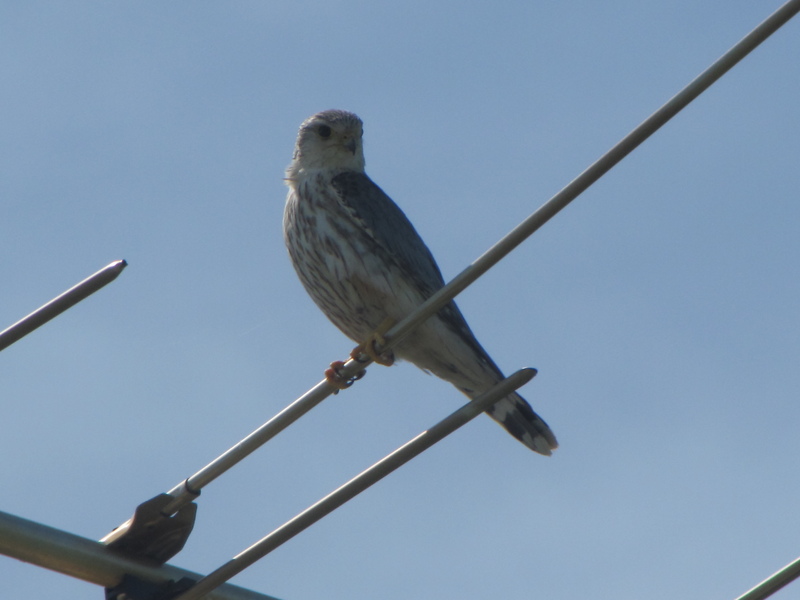 Some people see Cooper’s Hawks, Sharp-shinned Hawks and Merlins hanging around the yard hoping to catch some of the feeder birds. 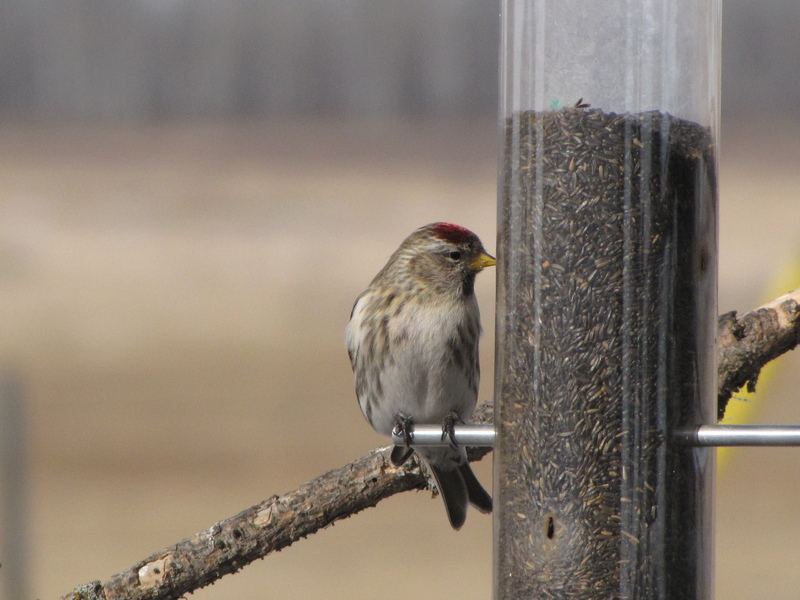 If you are in or around the Edmonton area, the Wild Bird General Store has a remarkable assortment of bird seed (from small brown bags to big barrels in bulk), bird feeders, bird baths, and anything you can think of relating to birds. Many hardware stores have a good selection of bird feeding items as well.